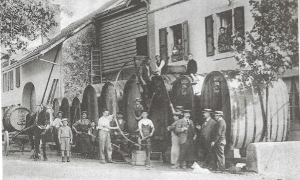 In 1870, Jean Straub master cooper, left the canton of Bern and moved to Vinzel. After working with another cooper of the village, he built his own cooper shop and started as well a winemaker activity by renting and buying his first vineyards. In parallel, he developed a flourishing wine trade by buying the best crus appellations of Canton Vaud. In 1955, Jean Straub, his grandson, seized the opportunity to buy the vineyard estate of La Tuilière. This vineyard gradually expanded until today. It consists of 18 hectares including 2.6 hectares of vineyards. Since 1991, Philip Straub took over the business and introduced new grape varieties.